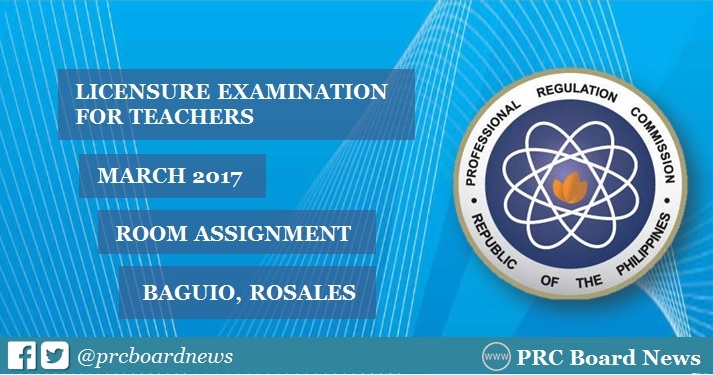 The Professional Regulation Commission (PRC) Baguio regional office has released list of room assignment for examinees of March 26, 2017 (Sunday) Licensure Exam for Teachers (LET) in Baguio City and Rosales, Pangasinan. PRC Baguio initially published the list of qualified examinees through Online Verification of Room Assignments (OVERA) and announced that room assignment will be posted starting Monday, March 13. "Verify your application number on the day of examination from the room watchers/proctors assigned in the room," PRC Baguio advised. For any clarifications or corrections on documents, you may coordinate with Jason or Marlon at (074) 304-3180 or e-mail prcbaguio.application@gmail.com. March 2017 LET will be administered simultaneously in the cities of Cagayan de Oro, Catarman (Northern Samar), Cebu, Davao, Iloilo, Legaspi, Lucena, Manila, Puerto Princesa (Palawan), San Jose (Occidental Mindoro), Tacloban, Tuguegarao City and Pagadian.